It is replaced by the Honeywell TT8810. Continuing our commitment to innovative consumer activated e-transaction systems the TT3100 is designed to streamline point of transaction and back office operations reduce costs and improve customer service. The user-friendly interactive device combines split-screen display MSR and signature capture capabilities all in a single unit. Both RS-232 and RS-485 connectivity are supported by the 3100 and will automatically auto configure to the correct protocol. 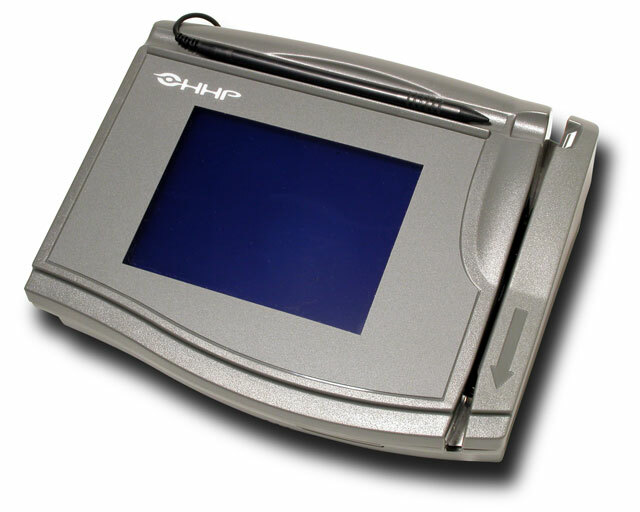 Auxiliary RS-232 peripherals can be attached to the TT3100 allowing data to transparently pass through to the host. The TT3100 is the ultimate way to integrate other peripherals and eliminate additional equipment. Designed with a built-in three track magnetic stripe reader for credit-debit transactions the TT3100 boasts a 4.5 x 3.3 LCD window - so large it can display line item detail and point of transaction promotions simultaneously. Fully programmable for both text and graphics the easy-to-read backlit screen displays logos ads and administers consumer surveys. The TT3100 is PIN secure using either DUKPT or Master-Session key management. If there is an interruption of power to the unit battery back-up protects valuable data from being lost. Because the TT3100 utilizes passive pen technology the unit is virtually maintenance-free --there's never a need for expensive electronic pen replacement. The TT3100 is rugged durable and built to last. For special needs customers the TT3100 can be loaded with larger fonts and its light weight and mounting points allow for secure attachment to a counter stand. Continuing our commitment to innovative consumer activated etransaction systems, the TT3100 Series streamlines point-of-transaction and back office operations, reduces costs, and improves customer service. This user-friendly, interactive device combines a split screen display, MSR, and signature capture capabilities, all in a single unit. The TT3100 Series supports both RS-232 and IBM RS-485 connectivity, automatically auto-configures to the correct protocol, and allows auxiliary RS-232 peripheral devices to pass data to the host transparently. The TT3100 boasts a 4.5 x 3.3 inch (11.4 x 8.4 cm) LCD window â€“ so large that it displays line item detail while simultaneously pointing to transaction promotions. The TT3100 is fully programmable for both text and graphics, and the easy-to-read backlit screen will display logos and ads and will administer customer surveys. The TT3100 Series is PIN secure, using either DUKPT or Master/ Session key management. If there is an interruption of power to the unit, battery backup protects valuable data from being lost. Because the TT3100 Series utilizes passive pen technology, the unit is virtually maintenance-free â€“ thereâ€™s never a need for expensive electronic pen replacement. The TT3100 model offers an added benefit of a Screen Protector System with field-replaceable overlays. This feature extends the life of the display screen and offers protection from an occasional light exposure to water. Ideal for the retail, hospitality, financial services, security, and ID markets, the TT3100 integrates easily with any PC or pointof- transaction system running on open operating systems, such as MicrosoftÂ® MS-DOSÂ®, WindowsÂ® 3.x, Windows 95Â®, Windows 98Â®, Windows 2000Â®, and Windows NTÂ® version 3.51 and higher. Customer applications are developed using an included TT3100 Software Suite.